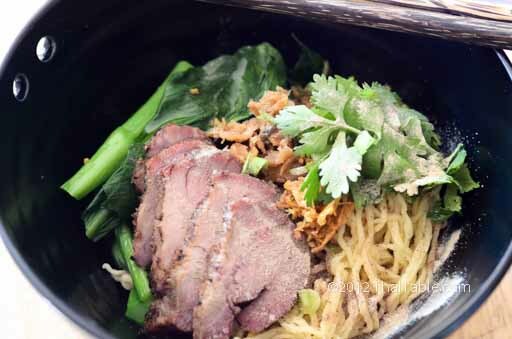 Egg noodles with barbeque pork is a great lunch that many Thais enjoy. Great egg noodles should be al dente. Your choices of seasonings are sugar, ground chili pepper, pickled peppers and fish sauce. The noodle shops will start you off with small amount of seasoning in your noodles, the rest is for you to add to your liking. Egg noodles with barbeque pork is my husband's favorite lunch. It's fast and easy and has a sophisticated and complex taste. The salty Chinese cabbage, fried garlic, pepper, vinegar and fish sauce come together in an extremely complementary way. 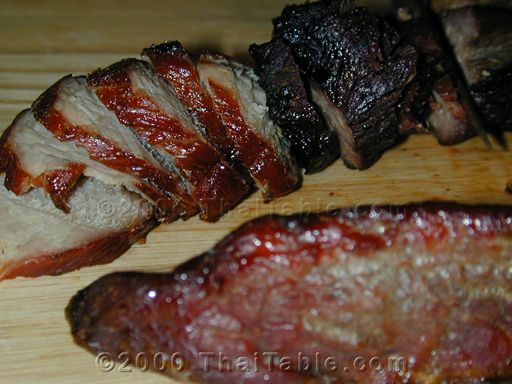 Barbeque pork can be cooked and frozen ahead of time. Egg noodles can be frozen as well. But let the noodles thaw out first before cooking them. I have tried cooking the noodles right out from the freezer, and they did not separate or cook in the middle. Or you can get barbeque pork from Chinese markets and restaurants, too. Boil water in a pot. 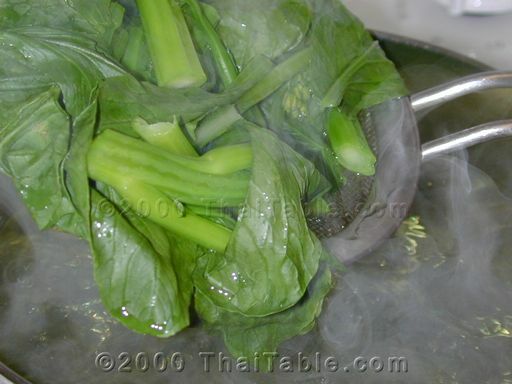 Cut the fresh Chinese mustard cabbage in a bite size pieces and blanch them in boiling water. Fish the mustard cabbage pieces from the boiling water and put them into serving bowls. 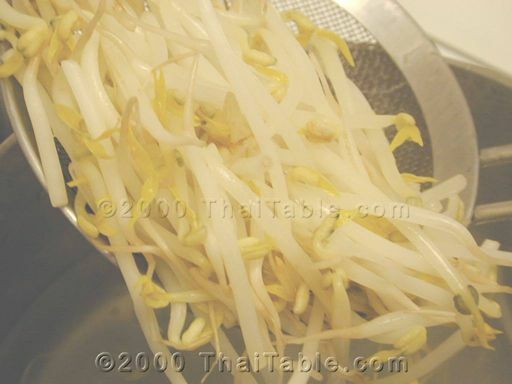 If you prefer your bean sprouts cooked, blanch them now and put them in the bowls. Take one ball of the fresh noodles and separate the strands somewhat (you can do this by tossing it in the air a couple inches and pulling it apart with both hands). Dump the noodles in boiling water. Use chopsticks to separate them while cooking. Boil for 1 minute. Be careful not to over cook the noodles. 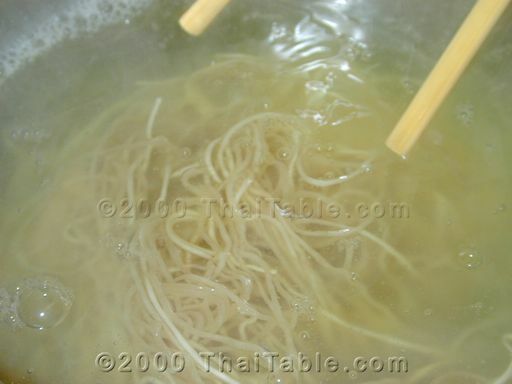 Use a chopsticks or strainer to fetch the noodles and get rid of excess water. Put the noodles in the bowl. 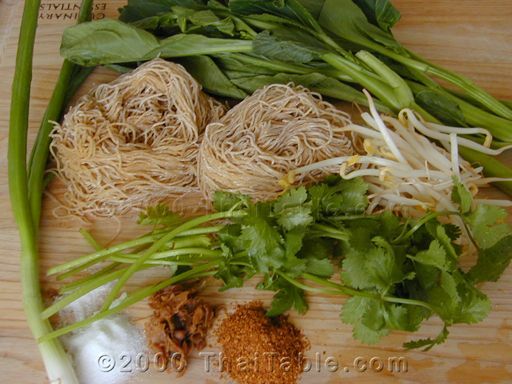 Add a tablespoon of fried garlic and mix the noodles well so they don't stick together. Add fish sauce, sugar, vinegar, and ground chili pepper. Sprinkle sliced green onion and cilantro and preserved Chinese cabbage. Slice barbeque pork 1/8 inch thick and add it to the noodles. Top with fried garlic and a dash of ground white pepper. As always when serving noodles, fish sauce, sugar, ground chili pepper, and chili vinegar should accompany the meal.